Organic chocolate with hazelnuts (12 %) & currants (12 %). Suitable for vegetarians. Our dark 60 % chocolate with roasted hazelnuts and currants. 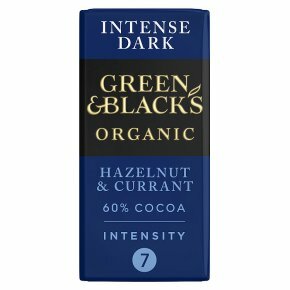 The fruity notes of our dark 60 % chocolate are complimented by the sweetness of Greek currants, while crunchy hazelnuts offer their deliciously nutty and savoury character. At Green & Black's we aim to ensure that all nut shells are removed from the hazelnuts, but the process involved does not allow an absolute guarantee of this.